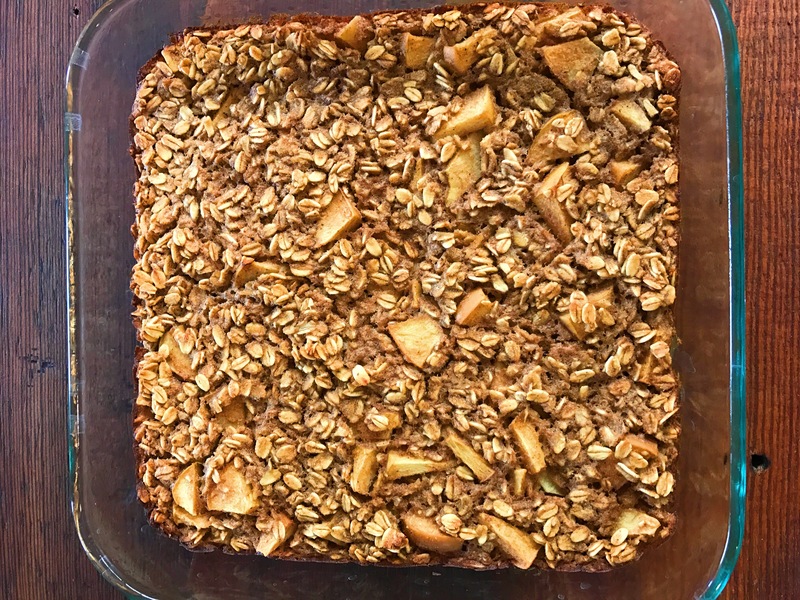 In honor of National Oatmeal Day on 10/29/16 (tell me about it; they have a day for everything), I wanted to share this recipe for Apple Cinnamon Baked Oatmeal. I love it! The texture sort of reminds me of firm bread pudding. Better yet, it has no dairy, eggs, oil, gluten and is sweetened only with fruit! It’s really easy to make and great to serve for a brunch, your own breakfast or I often eat it as a snack. I like to eat it cold with a little soy milk poured on top, but it’s also really good warm. It’s mildly sweet so a little maple syrup drizzle wouldn’t be the worst idea. 🙂 One quarter of the pan is officially a serving but when eating it as a snack I generally slice up an eighth of the pan. 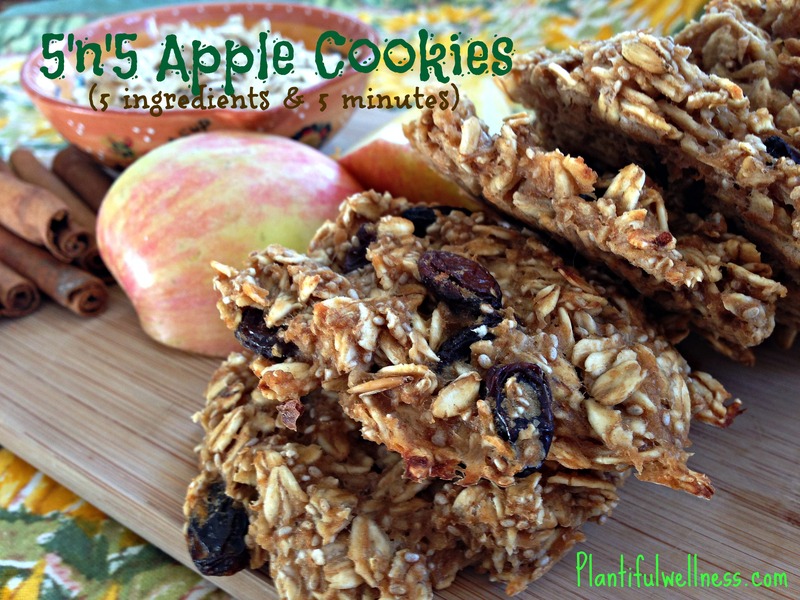 5’n’5 Apple Cookies – 5 Ingredients & 5 Minutes! 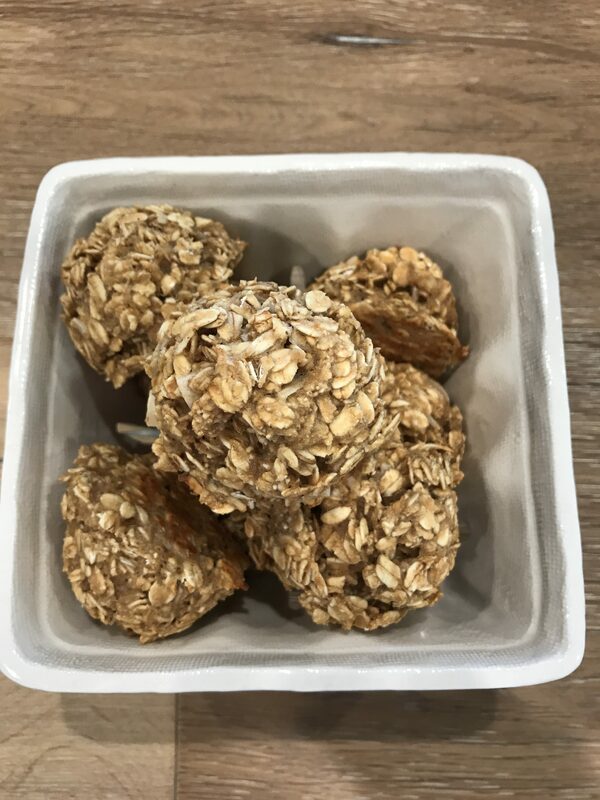 I’ve attempted to create granola-type bars in the past and haven’t been happy with the results. I got lucky this time. These are super easy to make and very quick. 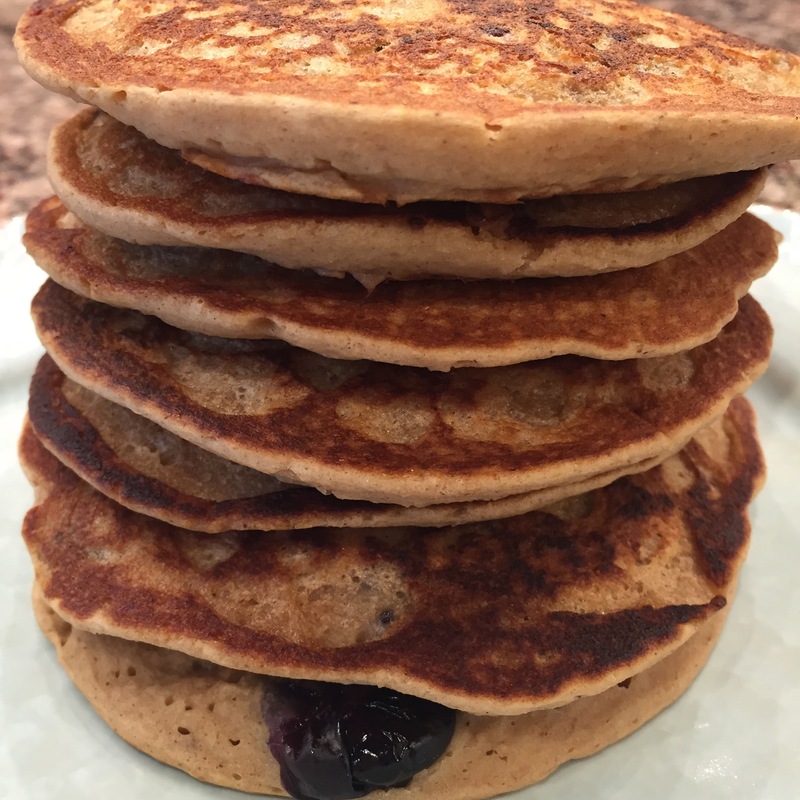 They are packed with Omega-3’s, protein and fiber. Note: this recipe is only gluten-free if you use certified gluten-free oats and oat flour, which are both easy to come by. Nothin’ fancy about these veggie patties, but they are easy, tasty and satisfying. I ate mine plain, with catsup, but I would love to try one on a whole grain bun with caramelized onions and all the fixins. Yum. Make sure to use certified gluten-free oats and soy sauce (tamari) if you need these to be bona fide gluten-free. Several years ago, I asked hubby for a bread maker. My big plan was to make lots of fresh-baked loaves of bread and never have to buy another loaf again. Ah, to be young with such lofty goals. I baked one loaf, it wasn’t great, and the unit was stored in the garage for several years. My older, and much wiser self decided to dust that bad boy off and give the whole bread-making thing another shot. SO glad I did! My amazingly wonderful friend Donna makes bread all the time and is always telling me how fun and easy it is – and how great it makes the house smell. She was so right! 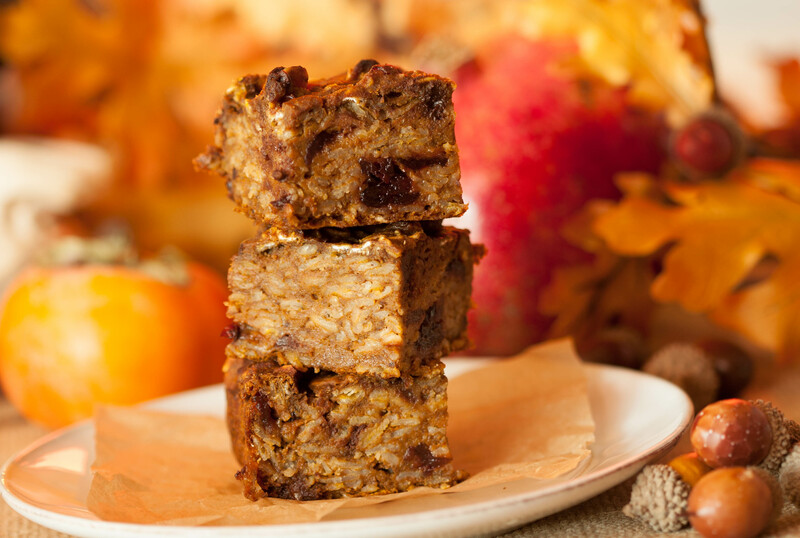 I did some research and played around a bit with ingredients and ultimately came up with this whole grain treat. If you don’t have a bread maker, ask Santa or whomever to bring you one. You literally dump the ingredients in the metal “bowl”, and walk away. Definitely the lazy man’s way to make bread (though not as lazy as buying a loaf at the store!). Cinnamon-Raisin Oatmeal Muffin Recipe. Vegan, Oil-Free, Low-Fat, Wheat-Free! Good for Breakfast, Snack or Dessert. I was inspired to create these tasty muffins as I was preparing for a 5 hour flight for which I would be leaving my house at 5 a.m. I knew it would be too early for my usual breakfast smoothie, and I was already planning on packing a PB&J sandwich for later in the day….what would I eat for breakfast?? God knows there wouldn’t be options on the plane. Sure, I could have brought Starbuck’s oatmeal or McDougall’s instant oatmeal (great for travel) on with me but I wanted something different; something substantial, not too sweet, and didn’t need to be warmed. Thus, these Cinnamon-Raisin Oatmeal Muffins were born! Pumpkin Treats! Low-Fat, Oil-Free, Wheat-Free, Guilt-Free! I’m all about the pumpkin. It’s one of the many things I adore about fall. I love the look of those orange beauties, and the flavor of anything pumpkin. I only wish the pumpkin bread, scones and pumpkin spice lattes at Starbucks were healthy! Oh well, these little treats, along with my Pumpkin Pancakes (see Recipes), and Pumpkin Pie Minis (recipe coming soon) will suffice. They do contain chocolate chips, taking the healthy factor down a notch, but it’s a small amount and just enough to make you feel like you’ve been treated.